The following is a copy of the newsletter published by the ‘Hope for Sderot’ organization in Israel. 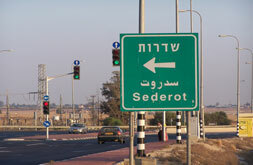 This last week was the hardest week in the history of Hope For Sderot. It was harder than the 2008 Gaza war, harder than the last five years of Kassam rocket attacks, it was even harder than the last war we just had with Gaza; like I said it was the hardest week we have ever had. Over the past four years our volunteers have gathered together on Tuesdays and packed bags of food for the following Wednesday. On Wednesday we would meet at 9:30 and set out chairs and fill up the water jug with ice water for the people that would come in to have a place to sit or have a class of cold water. At 10 o’clock we would open our doors to be greeted by 15-20 people already waiting to come in and pick up their food bag. By 12:30 lunch would be on the table to feed our volunteers, but all that changed last week and it will not be the same all this month. 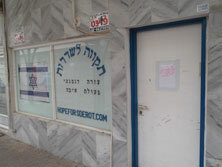 This is the first time we had to close the doors on Hope For Sderot because we had no food to give out. 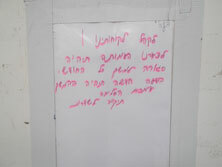 With a sign posted on the door in Hebrew and in Russian we informed our friends that we did not have food and that we would be taking this month to try to restock our supplies for next month. After our last newsletter someone emailed us and asked to be taken off our “Beg List”. I hope this newsletter is not seen as a “Beg List”, for it has never been intended as such but rather simply a letter of information. If you can and want to help Thank You, if you can’t we understand..
We have 445 families who look to us each month for help to feed their children, their elderly and those injured by Kassam. It takes $11,000 a month to accomplish this and in February we didn’t have it. This newsletter goes out to only 1400 people; of those we have no idea how many of them just get deleted without ever being read but if those of you who actually read our newsletters were to help us with just $10 a month, the sign that is now on our door would never have to go up again. If you would forward this to your friends on your mailing list, just maybe one of them who has never heard about Sderot might want to help and even send this email on to their friends. Will you consider helping us with a monthly donation or maybe a “Forward” of this newsletter to your friends? You can click here to donate or here to contact us. Thank you in advance for your help. “As Christians around the world prepare to celebrate Christmas together with family and friends, we extend, on behalf of B’nai Brith Canada, warm greetings to our Christian Friends with best wishes for a Merry Christmas and a Happy New Year. We hope the Holiday will be filled with meaning and growth for you and your families. This Holiday season is a time to recall the spiritual foundation of Canada that is rooted in Judaeo-Christian values which teach us that we should be grateful for all the things we have, and keep in mind those who are less fortunate. You are currently browsing the archives for the Christian Jewish Dialog category.